The Malmo based Eka trio is a collaborative group that blends together rock inspired rhythms and jazzy spontaneity to create vibrant and impressionistic music. The eponymous debut consists of eleven captivating originals that are thematically alike but with sufficient distinctiveness as to result in a conceptually cohesive recording without resorting to redundancy. The tracks are simultaneously intimate and cinematic with seamless synergy among the members of the band. The lullaby like "Blues Screen Blues," for instance, opens with Swedish guitarist Tomas Hörnberg's resonant and lilting phrases unfurling over Norwegian bassist Anne Marte Eggen's warm, reverberating tones and Finnish drummer Pontus Häggblom's elegant rolls and cymbal splashes. As the performance progresses it becomes delightfully dark and poetic with a dramatic ambience. The sophisticated three-way conversation is mesmerizing and expectant. The pastoral "Tö" evokes an aura of early spring melancholy and hope. Eggen opens with an eloquent and contemplative monologue that her bandmates support with their sparse and hypnotic refrains. Hörnberg follows with intricately built and emotive instrumental musings while Eggen and Häggblom lay out a rumbling backdrop. There are high energy moments where the album becomes delightfully effervescent. The whimsical "Tack før igår" starts with a light and pleasant ensemble play. Out of this charming, relaxed atmosphere emerges Eggen with a lyrical soliloquy that is complex, melodic and fluid. The up-tempo "Insects!," meanwhile, has a restless and percolating cadence. Hörnberg embellishes the tune with fiery agility and vivid passion. Eggen with her muscular strings and Häggblom and his thundering kit provide Hörnberg with exciting and lively support. One of the highlights of this uniformly engaging release is the riotous "Chimär": Hörnberg lets loose blistering, dissonant lines weaving an eastern motif into the intensely cinematic piece. It is haunting and poignant reminiscent of early Jazz-Rock fusion works. Häggblom concludes with a memorable solo suggestive of a gentle rainfall. With their freshman effort the members of the Eka trio have already demonstrated their immense talent and their spirited individuality. Their uniqueness stems not only from their refreshingly imaginative material but also from their bold creativity and accomplished musicianship. 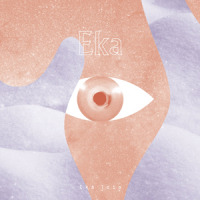 Eka, hopefully, is just the beginning of their brilliant careers. Track Listing: Oktember; Blue Screen Blues; Detours; Nästan nästa; Chimär; Tö; Kastrup; Insects! ; Away; Tack før igår; Mars. Personnel: Tomas Hörnberg: guitar; Anne Marte Eggen: bass; Pontus Häggblom: drums.